Daniel Lugo: My name is Daniel Lugo and I believe in fitness. 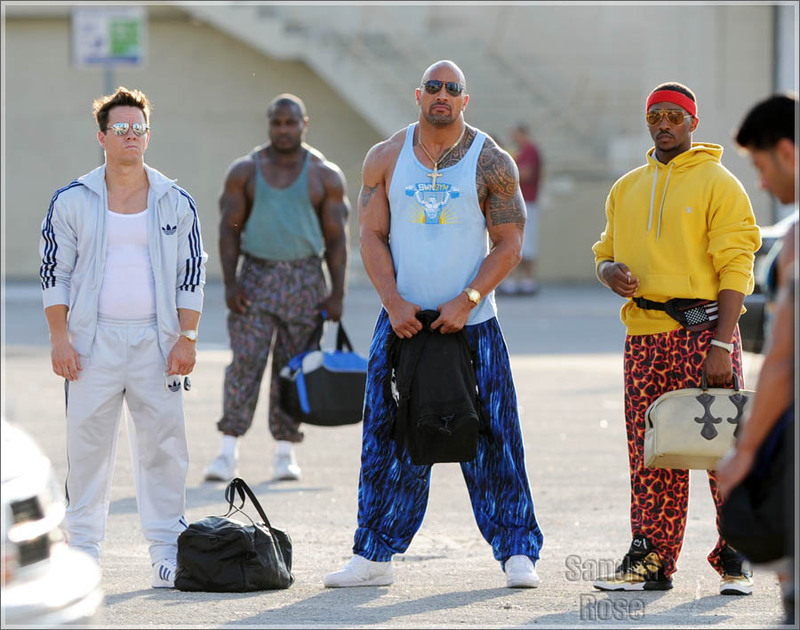 Pain & Gain is what it looks like when Michael Bay decides he wants to make a little movie, as opposed to another action epic. The director known for making bombastic action blockbusters has taken a step back to make a smaller film based on a true story, but it does not mean he put his signature style in check. Pain & Gain is very glossy film, gorgeous at times, and certainly not subtle. It is also an incredibly dark comedy, with a story so ridiculous that it has to be true, and it is. Based on a true crime story, this film does its best to depict what happens when seemingly good-natured crooks get in way over their heads and resort to drastic measures to achieve their American dream. While Bay’s style can be grating for some, the mix of a strong cast and a messy, but compelling story makes this a film with a lot more going on than the standard Bay blockbuster. Set in mid-90s Miami, Florida, the film stars Mark Wahlberg as Daniel Lugo, a bodybuilder looking to become a much bigger success in life. While he has had trouble with the law before, Lugo currently works at the Sun Gym, where he develops a scheme to kidnap gym regular and spoiled businessman Victor Kershaw (Tony Shalhoub). Along with his friend Adrian (Anthony Mackie) and a recently released criminal, Paul Doyle (Dwayne Johnson), the three go through with kidnapping, torturing, and extorting money from Kershaw. The plan is not at all flawless, which eventually leads to a private eye, Ed Du Bois (Ed Harris), working to catch the Sun Gym Gang. Regardless, these bodybuilders never learn their limits, leading them down darker paths in an effort to take more of what is not theirs. This is the messiest, darkly comic, crime caper I have seen since Tony Scott’s Domino, which told the story of real life bounty hunter Domino Harvey. This is not a complaint, however, as these are both messy films that I enjoyed, with the flaws of the film being associated more with certain filmmaking decisions, rather than the story itself. 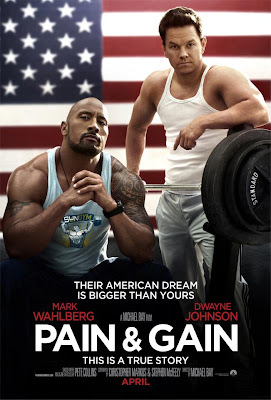 Having read the lengthy magazine articles, also titled “Pain & Gain” by Pete Collins, composed of all the facts and testimonies given by the actual people associated with the crimes, it is a credit to screenwriters Christopher Markus and Stephen McFeely that they were able to structure the elements of the true story into the parameters of a film. The story is certainly sprawling, but there is an absorbing aspect to what we are being shown and told is happening to the various characters, as things go from bad to worse, in terms of the events depicted. Last week I had to, for whatever reason, defend the stardom of Tom Cruise in my review for Oblivion. This week may be a tad more difficult, given that I have to speak up for Michael Bay. While Bay is not a favorite director of mine, he has certainly established himself as an auteur. He has an established and recognizable style that he is able to bring to the screen on his own terms. Regardless of the films he has made that are less than…well good (though I will standby in saying that The Rock is one of the best action films of the 90s), he continues to make crowd pleasing spectacles (from a general audience and box office-related standpoint), despite being the punching bag of many critics. 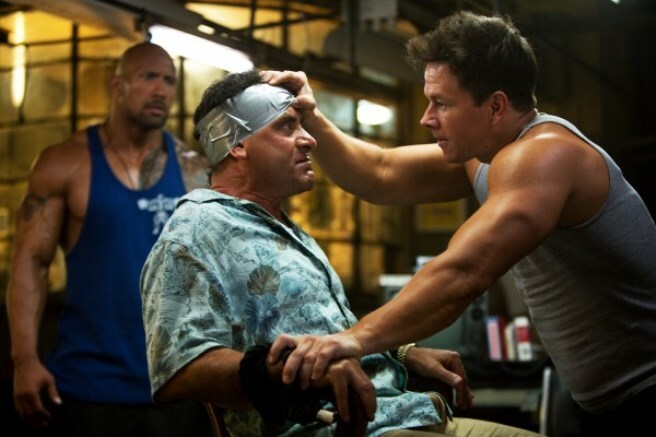 With Pain & Gain, it is clear that Bay wanted to make something smaller and different from his other films. However, despite the heavily reduced budget compared to his last giant f’ing robots movie epic, a Bay film still looks very much like a Bay film. 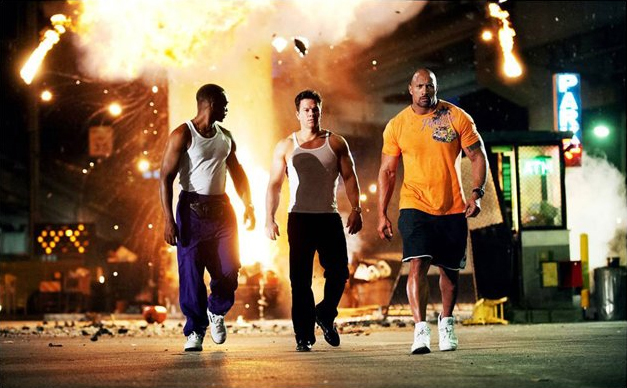 Pain & Gain is not at all short of excessive visual flourishes, the sheen of stunning car/lingerie commercials, plenty of lens flares, slow motion, and more. Does this aid the film? Well, it does and it doesn’t. On the one hand, the film practically could have been shorter if the exaggerated style and slow motion shots were dialed back a notch. On the other hand, that is kind of the point, based on the plot of the film. While I would not say that Bay is parodying himself, based on him doing very Bay-like things in a film drastically different than his others, I would say that having Wahlberg, Johnson, and Mackie existing in a world where they are literally stealing the American dream and trying to become something they are not has a kind of fitting balance with the film’s overreaching visual style. The real issue is similar to problems that many Bay films suffer. He does not know when enough is enough. The plot and characters that exist in real life and in this film are compelling and darkly comedic in their own right, yet we once again have a lot more forced humor, which seems to have been done on the fly. It is a shame too, because one thing that Bay is constantly able to do is have great casts in his films, give or take a few comedic actors that people may be hot or cold on, but only some seem to nail their roles. Tony Shalhoub, for example, has a lot to work with and plays well with making a dislikable person tolerable, given the torture he is put through. Ken Jeong, on the other hand, seems like a person that Michael Bay just really likes to laugh at, so he has him filling in screen time for no real reason. All three leads (who are huge in this film) are at their best, as they have the right kind of charisma to be playing the characters that commit deplorable acts throughout. Wahlberg is usually most effective in roles that require his earnestness and comic timing, which is on display here. Dwayne Johnson is just immensely likable already, but he is given the chance to be all over the place as a former cocaine addict who was born again and does not want to hurt people. And then you have Anthony Mackie, taking a chance to get very beefy and play a very dim criminal to comedic effect. Michael Bay may never reach the wittiness of the films he enjoys from the Coen Brothers or Tarantino, but you can clearly see their influences on this film, as the characters here remind me of many I have seen in films like Fargo and Pulp Fiction and the outlandishness of the story is unfolded in a familiar manner. 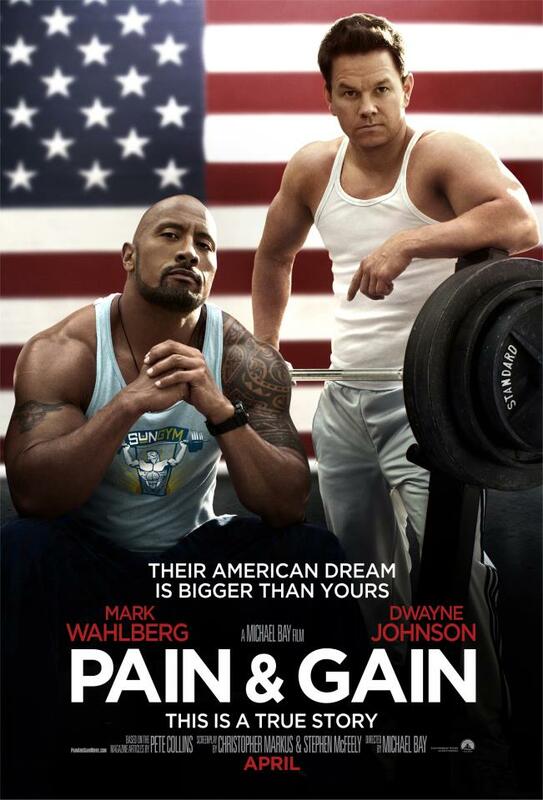 So what Pain & Gain amounts to be is a series of highs, met with some issues that keep it from joining the ranks of more well-loved comedy capers, regardless of how dark they may be. The story very juicy, as you have a real life tale to tell that actually had to scale back the absurdity to fit the structure of a film. There is also a great cast here, reveling in the chance to play in a film that skirts into very dark territory by lacing itself with a humorous touch. Then you have Michael Bay’s ultra-stylish hand at play, which leads to a combination of great imagery and directorial touches that bring forward some of Bay’s less than enjoyable tendencies. This is Bay’s small film that features big men, and while it is quite messy, it still knows how to pull its own weight. Daniel Lugo: I've watched a lot of movies Paul, I know what I'm doing. The extraordinary story of a skinny lad from Manchester who rose to become British Champion bodybuilder. And there the cliches end in this gritty, humorous and brutally honest tale which strips away the dream tan and any illusion of a glamorous lifestyle to lay bare the sport as never before. Jim Moore writes about the all-too-often taboo subjects of performance-enhancing drugs, the debilitating illnesses and mental health problems which blight the scene. He takes the reader behind the stage curtain to reveal the murky depths to which some - including himself - will plunge in search of success. Moore reveals the shocking contradictions and dangers inherent in the bread-and-butter running of the sport, matched only by the intensity and insanity of his own dedication. It was this never-say-die approach which eventually saw Moore crowned a national champion five times; but also an attitude which ultimately almost caused his death. Read the above book and expected the usual diatribe. This book is inspirational, funny and sad..sometimes all at the same time. Loved it!